The International Water Association Efficient 2013 conference 22-25 October in Paris covered the spectrum of water conservation, non-revenue water management, waste water management, and surface water/ flood management. On the final day I attended a field trip to The Three Rivers Development in Stains, on the outskirts of Paris, to gain an appreciation of surface water management approaches in France. The site is a new housing development on brownfield land that was originally a paints and solvents factory. 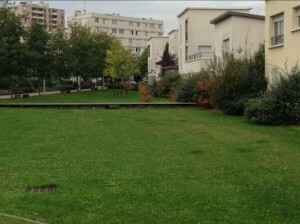 Surface water flooding is a major constraint to development on the site and similar sites with increasing urbanisation in the Seine-Saint-Denis Council area. This has led to an integration of landscaping and water management/ engineering requirements with multiple benefits for the community. In this blog I set out the drivers, key features of the site, lessons we can learn from the approach in France, and how this fits within a Water Sensitive Urban Design context. Cost of infrastructure and sustainability were key drivers for the project. A separate sewer and rainwater/ stormwater network exists within this housing development area. The volumes from a 1 in 10 year rainfall event would be too costly or infeasible to transfer directly through the piped water network to the Seine. Underground storage infrastructure has been found to fail due to lack of maintenance. As a result regulation has been imposed to require storage above ground. The main objective for the site was to account for rain and the landscape jointly to enable multiple uses and provide wider benefits for the development. Due to potential pollution from contaminated land on the site above ground storage of surface water was the main consideration rather than infiltration. We entered the site and walked on a pathway next to a set of swales combined with flower gardens that led to the main square. The joint landscape and water management features are built along the edge of the current housing development and a future housing development adjacent to this site will need to provide its own features for surface water storage. A decision was made to use shallow swales only (less than 40mm) to ensure public safety and this required greater area on the site. The main square was designed using hard surfaces in recognition that in urban environments damage by cars, pedestrians and cyclists crossing the area could reduce its function and damage the site. A set of “waves” is a key feature in the square and are designed to divide the rainwater retention zones into compartments as well as providing a fun feature for local children to cycle on. A 100m3 underground storage tank below the site provides storage for smaller rainfall events to reduce flooding of the square and ensure pedestrian access is maintained throughout the year (water is visible at the site 5/6 times per year). 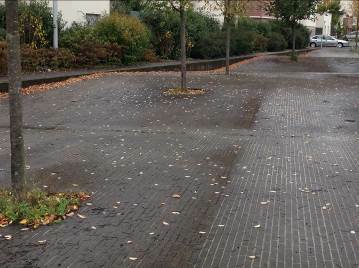 Runoff from the parking areas is treated by pollution interceptors. 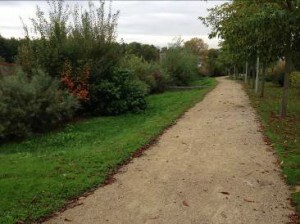 A raised boardwalk then follows a deeper set of Swales following the main square. Rooftops drain into open concrete channels and these are piped under the boardwalk to the square. 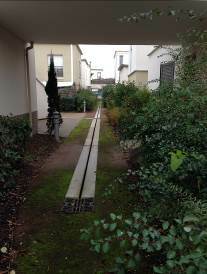 The benefits of concrete channels are that they can be kept open through vacuum maintenance equipment. 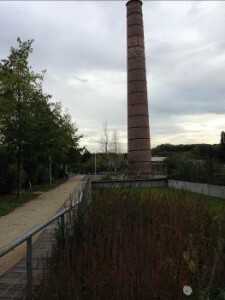 The most polluted part of the site is a dry island due to contaminated soil and has been designed to be partially watertight with clay and geomembranes. A vortex system is used to balance water between two of the deeper Swales and there is no pumping involved with the system. Finally a large park area/ games field adjacent to the households is used as a sacrificial flooding space, however a wooden pontoon ensures access for residents is maintained. What can we learn from this in the UK and internationally? This site has been successfully achieving its objective of multiple benefits for over 10 years and we can learn from this experience. Over 20 years this approach has been applied to 1400 sites with 700 demonstrating similar levels of integration between landscaping and water management. A key element has been joining up those responsible for sanitation (water management) and landscaping in the local authority. This has ensured correct vegetation management balancing space for recreation and more natural flood features. Additionally replacement with appropriate trees according to their evapotranspiration and water management characteristics has been a major factor in ensuring the function of the features. The community has an understanding of surface water management and can see how this affects their public spaces and appreciate the role of water in their environment. A key consideration is that the community isn’t affected by the water management infrastructure, so they can still use the pathways to access their houses but loose some of the recreation space when this is holding floodwater. Additionally, residents have started to install their own water barrels and make use of this rainwater harvesting for their gardens and other uses. The overall cost of this approach was estimated at EUR800/m3. For a surface area of 18,000m2 the cost was EUR4.2m. The open-air rainwater management approach can save on investment and operating costs in the long term. Increased recreational use of the site can result in higher maintenance requirements than features that aren’t integrated with the landscaping, however this social use also ensures investment in the features to ensure flood management. 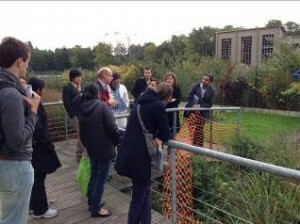 How can water sensitive urban design principles strengthen the French approach? Water Sensitive Urban Design (WSUD) is a holistic approach to planning/ retrofitting development within the limits of the water environment which has been developed in Australia and is being applied in the UK and widely internationally (outlined in a previous blog). A WSUD approach to this new development could have considered household scale rainwater harvesting options that reduce surface water and reduce demand on public water supply. Behaviour change for water efficiency can be enhanced as the community is already engaged by their local water environment. In fitting with the capacity building elements of WSUD the site visit was hosted by the champions of this approach from the Seine-Saint-Dennis council and the lessons learned from this site have been shared in France and internationally. Ricardo-AEA are currently developing Flood Resilient Design Guidance and business cases for integrated water management to support Local Economic Partnerships and will capture this best practice within these projects also. The lessons learned from the French approach can also apply to how we consider the relationships between partners in delivering sustainable drainage in the UK and how maintenance functions are handled within local authorities to ensure long-term sustainability and realisation of multiple benefits from SuDS and WSUD. This is particularly important as the SuDS Approval Bodies and changes to surface water management take shape.